Foot-and-Mouth Disease Spreads to Humans in England? 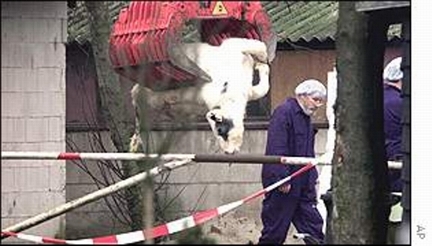 As of April 24, 2001, England has slaughtered 1,974,000 hoofed animals and plans to slaughter 232,000 more animals in an effort to stop the rapidly spreading "O" strain of the foot-and-mouth virus that has plagued the United Kingdom since February 2001. Photograph © 2001 by Associated Press. April 24, 2001 Plum Island east of Orient, Long Island, New York - Today in England, three suspected cases of human foot-and-mouth disease are being investigated by the British Public Health Laboratory. One of the patients is a man from Cumbria who developed blisters in his mouth and sore, itchy hands while working on a crew slaughtering hoofed animals infected with foot-and-mouth disease. Officials are waiting to hear from laboratory test results which should be in next week. If the humans test positive for foot-and-mouth disease, it means the virus moved from animals to people.